In this page we present few reduced analyses for concrete Texas Hold’em hands that are representative for their categories. A poker hand is identified through a card configuration (community board and the own hole cards) and the number of the opponents at the moment of analysis. The analyses are reduced with respect to the relevance of their results for a probability-based strategy; that is, we provided those numerical results that weight the most within such a strategy toward making decisions. In providing the results, we followed the scheme that we used within the mathematical model of the strength of a hand, namely associating the probability of achieving a formation or type of formation for own hand by river with the probability of your opponents achieving something higher, in the assumption that you make that achievement. This scheme actually fills in the strength matrix of a hand, however in the reduced mode the matrix is completed only in its relevant parts, namely with the relevant probabilities. Each application is labeled through a general category where it belongs, in the field named General circumstances. This category describes in general terms the card configuration of the hand that represents it and one can continue to unfold it successively into several sub-categories, to more particular card configurations. Keep in mind that for identical card configurations, the probabilities for the own hand are the same, while the probabilities for the opponents’ hands vary with the number of opponents (the higher this number, the higher these probabilities. 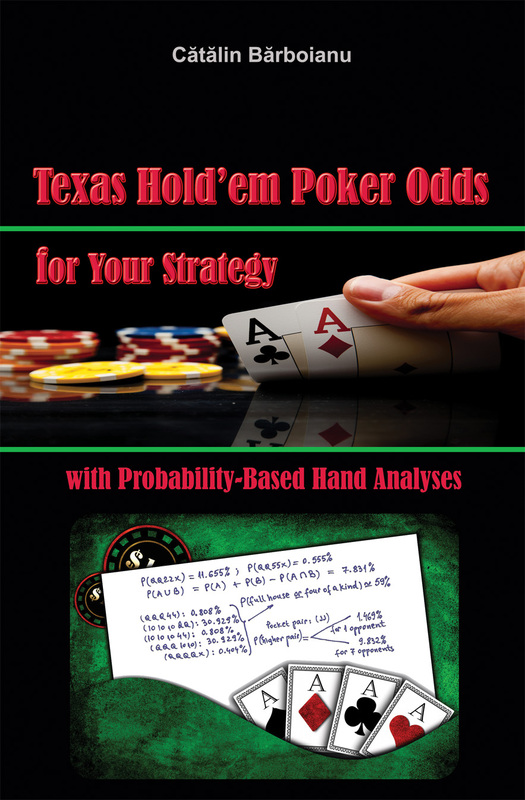 You can find a larger collection of such hand analyses in the book Texas Hold’em Poker Odds for Your Strategy, with Probability-Based Hand Analyses. General circumstances (these refer to your own hand): Nothing achieved; straight or flush not possible by river. At least two pairs is very likely to be achieved by your opponents, so we focus first on three of a kind for your own hand. The probability of achieving trips is 0.555%, which is very low. (2233x), (22QQx), (7733x), (77QQx), (JJ33x), (JJQQx), each with probability 0.832%. The probability of achieving two pairs is 4.995%. You have about 6% probability of achieving two pairs or three of a kind, which is low. Assuming two pairs achieved by river, let us see the odds of your opponents achieving something higher. Assume (2233x) achieved, which makes the board (27J23) and (3Q). Let us take three of a kind. The only possible three of a kind for your opponents is (222xy), as other triples beside 2’s would turn it into full house. The probability of (222xy) being achieved by at least one of your 5 opponents (if all remain in play by river) is 39.393%, which is high. To this probability, those for full house and four of a kind will add and therefore your opponents have an obvious advantage over you. The same probabilities apply for any other specific two pair assumed achieved. If the number of your opponents is 1 instead of 5, the probability they will achieve three of a kind (222xy) is only 8.686%, but also other odds will add in their favor from full house and four of a kind. General circumstances: One pair achieved, with one paired card on the community board; straight or flush not possible by river. The probability of achieving three of a kind (555xy) is 8.325%. The probability of achieving a full house is 2.496%. The probability of achieving three of a kind or full house is about 11%, and the expected three of a kind is an inferior one. Two pairs will have a better probability, but it is very likely that your opponents will beat it, once the community board will be paired (except for two pairs (AA55x), having the probability 11.655%). The probability of achieving three of a kind, a full house or two pairs (AA55x) is 22.476%. Assuming two pairs (AA55x) achieved by river, the probability that at least one opponent will achieve three of a kind is 40.633%, to which the odds for higher two pairs, for straight, flush, full house, and four of a kind will add in your opponents’ favor for a higher achievement. Assume now you will achieve a full house and let us see what are the probabilities that your opponents will achieve something higher. - Assume (55588) achieved, which makes the board (58Q58) and (5A). The probability of your opponents achieving something higher (a higher full house or four of a kind) is about 49%. - Assume (555QQ) achieved, which makes the board (58Q5Q) and (5A). The probability of your opponents achieving something higher is about 48%. - Assume (555AA) achieved, which makes the board (58Q5A) and (5A). The probability of your opponents achieving something higher is 4.242%. - Assume (88855) achieved, which makes the board (58Q88) and (5A). The probability of your opponents achieving something higher is about 97%. - Assume (QQQ55) achieved, which makes the board (58QQQ) and (5A). The probability of your opponents achieving something higher is about 95%. Overall, the probability that at least one opponent will achieve something higher if you achieve a full house by river is about 49%. General circumstances: One pair achieved, with one paired card on the community board; three suited cards, with one of them on the community board; no two suited cards on the community board; straight not possible by river. The probability of achieving three of a kind is 8.325%, full house has 2.496%, and flush has 4.162%. Assuming the flush (of ♦) achieved by river, the probability that at least one opponent will achieve a flush (still of ♦, as the only one possible) is 7.075% and the probability for a higher flush (with A) is even lower. General circumstances: A trip achieved; straight or flush not possible by river. The probability of achieving a full house is 28.583% and the probability of achieving four of a kind is 4.255%. 1) The community board completes with (Qx), x not being 4, Q, or 10. The probability of your opponents achieving a full house is about 49%, of which about 31% corresponds to (QQQ44). To this, the probability of other full houses higher than yours (depending on x) and four of a kind (0.404%) add in your opponents’ favor. 2) The community board completes with (10 x), x not being 4, Q, or 10. The probability of your opponents achieving a full house is about 6%, of which the probability of a full house higher than yours is about 4% (depending on x); four of a kind is not possible. 3) The community board completes with (10 10). The probability of your opponents achieving a full house is about 35%, of which 1.212% corresponds to a full house higher than yours; four of a kind is not possible. 4) The community board completes with (10 Q). The probability of your opponents achieving a full house is about 40%, of which 31.627% corresponds to a full house higher than yours; four of a kind has the probability 0.404%. The probability of your opponents achieving something higher than your full house is about 31.6%. 5) The community board completes with a pair (yy), with y different from 4, Q, and 10. The probability of your opponents achieving a full house is about 45%, of which the probability of a full house higher than yours could be of various values from 1% to 45%, depending on y; four of a kind has the probability 0.404%. The case when the board completes with (QQ) was not examined, as the achieved (QQQ44) full house will show on the community board and the opponents will benefit of it and even beat it. An overall probability of your opponents achieving something higher that your assumed full house over cases 1 through 5 is about 19%. Assume now four of a kind achieved by river, hence the last 4 comes on the board. The probability that your opponents will achieve four of a kind (which obviously will be higher than yours) is null if the board completes with a card different from Q and 0.404% otherwise, overall 0.026%. General circumstances: Two pairs achieved, with unpaired community board; straight or flush not possible by river. The probability of achieving a full house is 15.817% and the probability of achieving four of a kind is 0.184%. 1) The board completes with 3 and a card different from 3, 7, and Q. The probability of your opponents achieving a higher full house is between 3.5% – 6.6% (depending on the second card that completes the board). Four of a kind is not possible. 2) The board completes with 3 and 7. The probability of your opponents achieving a higher full house is 4.545%. Four of a kind is not possible. 3) The board completes with 3 and Q. The probability of your opponents achieving a higher full house is 38.571% and for four of a kind is 0.505%, so the probability of your opponents achieving something higher than your full house is 39.076%. Overall, the probability of your opponents achieving something higher than your full house is about 7%. Choosing 3 to come on the board for defining the three cases results in no loss of generality (3 and 7 has the same status in the given hand), and the probabilities are about the same if choosing 7 instead. General circumstances: Nothing achieved; four cards from a straight; flush not possible by river. The probability of achieving the straight (34567) by river is 8.695%. The probability is about 8.4%. General circumstances: One pair achieved, with no paired community board; straight or flush not possible by river. The best you can achieve is three of a kind (888xy), with probability 4.347%. (389 10 8) and (58), the possible higher formations for your opponents are full house and straight (higher three of a kind turns into full house and flush is not possible, as the assumed river card (8) cannot be of ♦). Overall, the probability that at least one opponent achieves something higher than your assumed three of kind formation is about 38%. General circumstances: One pair achieved, with no paired community board; four suited cards, with two on them on the community board; straight not possible by river. The probability of achieving a flush is 19.565% and the probability of achieving three of a kind is 4.347%, totaling 23.912%. The probability of a higher flush (with K♥ or A♥) is about 7%. The probability of a higher flush (with A♥) is 3.535%. The probability of a higher flush is null. Overall, the probability that at least one opponent will achieve a flush higher than your assumed flush is about 6%. General circumstances: Trip achieved; straight or flush not possible by river. The probability of achieving a full house by river is 19.563%, of which 6.521% corresponds to the probability of hitting a 7 on river (the best scenario for your own hand). The probability of achieving four of a kind by river is 2.173%. In total, you have 21.736% probability of achieving full house or four of a kind. Assuming a full house achieved with no 7 hit at river (take 8 hit, for instance), let us see what is the probability of your opponents achieving a full house or four of a kind (the only possible formations higher than yours, since straight and flush are not possible for them, either). The board is (448A8) and (47). The only possible four of a kind for your opponents is (8888x), with probability 0.202%. The overall probability of your opponents achieving something higher than your assumed full house is about 17.7%. Assuming four of a kind achieved by river by your own hand, the probability that your opponents will achieve something higher is null. General circumstances: Set achieved; straight or flush not possible by river. We have the same probabilities of achieving a full house (19.563%) and four of a kind (2.173%) as for hand 2.10, totaling 21.736%. Assuming a full house achieved by river (take 6 for instance as the river card, meaning (44466) achieved), let us see what is the probability of your opponents achieving a full house or four of a kind (the only possible formations higher than yours). The board is (456J6) and (44). The only possible four of a kind for your opponents is (6666x), with probability 0.303%. The overall probability of your opponents achieving something higher than your assumed full house is about 6.3%. Again, assuming four of a kind achieved by river by your own hand, the probability that your opponents will achieve something higher is null. General circumstances: Two pairs achieved, with no paired community board; straight or flush not possible by river. The probability of achieving a full house (hitting 7 or J at river) is 8.694%, of which 4.347% corresponds to the probability of hitting J. Assuming J hit (full house (JJJ77) achieved), let us the what is the probability of your opponents achieving something higher. The board is (37JAJ) and (7J). Four of a kind is not possible for your opponents. The overall probability of your opponents achieving something higher than your assumed full house is about 3.5%. General circumstances: One pair achieved, with community board not paired; maximum two suited cards and maximum two cards from a straight on the community board. Let us see what is the probability of your opponents achieving something higher than your (QQ) pair (a higher pair, two pairs, or three of a kind). The overall probability that your opponents achieve something higher than your pair is about 20%. General circumstances: Set achieved; three suited cards and three cards from a straight on the community board. Let us see what is the probability of your opponents achieving something higher than your set. The probability of your opponents achieving a flush (of ♥) is 17.346%. The overall probability that your opponents achieve something higher than your set is about 38%. General circumstances: Trip achieved, with no other pair on the community board; three cards from a straight and maximum two suited cards and on the community board. Let us see what is the probability of your opponents achieving something higher than your trip. The only possible straight for your opponents is (45678), with probability 4.800%. The overall probability that your opponents achieve something higher than your trip is about 12%. General circumstances: Two pairs achieved, with unpaired community board; three cards from a straight and maximum two suited cards and on the community board. Let us see what is the probability of your opponents achieving something higher than your two pairs. The only possible straight for your opponents is (789 10 J), with probability 4.215%. The overall probability that your opponents achieve something higher than your two pairs is about 40%. General circumstances: Full house achieved, with no pocket pair and only one pair on the community board. Let us see what is the probability of your opponents achieving something higher than your full house. The probability of your opponents achieving something higher than your full house is 2.828%. General circumstances: Straight achieved, with unpaired community board; three cards from the straight and three suited cards on the community board, with no pocket cards of that suit. Let us see what is the probability of your opponents achieving something higher than your straight. The only possible higher straight for your opponents is (56789), with probability 7.152%. Full house and four of a kind are not possible and the probability of a ♦-flush is 25.209%. The overall probability that your opponents achieve something higher than your straight is about 30%. You can find more such hand analyses in the book Texas Hold’em Poker Odds for Your Strategy, with Probability-Based Hand Analyses. The Mathematics Department of Infarom Publishing can perform probability-based hand analysis for any concrete Hold’em hand, per your request. Our team of mathematicians can also perform for you a large range of probability calculations for any game and any gaming situation. See the page Request calculation for details on this service. All Hold'em odds, for all gaming situations, and all the math behind the game, are covered in the book Texas Hold’em Poker Odds for Your Strategy, with Probability-Based Hand Analyses. The book holds all you need to now for using probability in your strategy, including examples and a relevant collection of probability-based analyses on concrete Hold'em hands. See the Books section for details. 777 Poker is the complete guide to poker with poker rooms reviews, tutorials and rules, events, articles, poker news & more. Check the Books section for details.